As I wrote in the intro, the theme for the first round was “Pretty in Pink”. No other information was given. The Iron Painter competition is a 5 round, bracket elimination style of competition. In the first round everyone competes for which bracket they will be seeded into (Gold, Silver or Bronze). 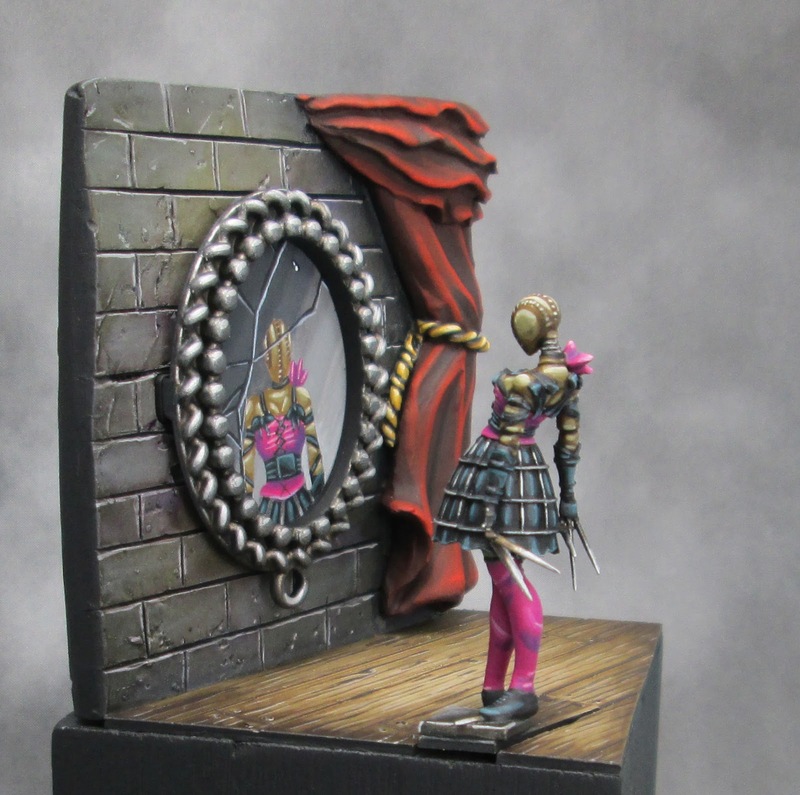 For the first round I chose to paint a Mannequin looking at herself sadly in a mirror with a little pink on the clothes. I’m hoping the mirror and pose cover the pretty and the clothing covers the pink part of the theme. Part of the scoring is on theme. This is the composite image I submitted for the competition. The mannequin’s diorama was fun to build. I used a small wood block I bought several years ago as the base. I built the wall out of Super Sculpey firm (an old crumbly block of it). 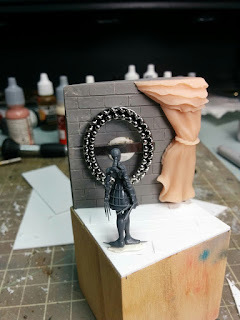 I baked it before building up the curtains over top out of regular Super Sculpey. I made the floor boards out of plasticard that I scribed with a little sculpting tool. I magnetized a floor board with the mannequin on it so I can put it on a gaming base for regular games. 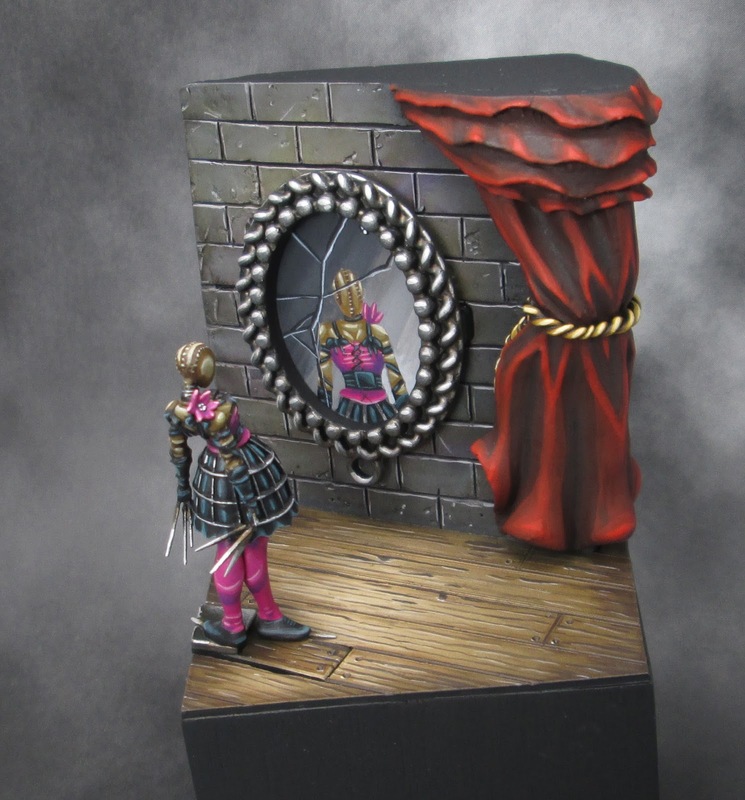 The most challenging aspect of painting this model was painting the reflection in the mirror. I thought about using a little mirror but decided to try painting it first. As I painted the physical model I painted the highlights onto a piece of cardstock to use for the reflection. I then painted in the background afterwards and added the cracks in the glass. Pink is a challenging colour to paint. I had lots of coverage issues as I primed black (a mistake for pink for sure!). I used Vallejo Game Colour Warlord Purple for most of the pink. I used the Reaper Master Series red triad) plus some lighter highlights and deeper shadows) for the red curtains. That’s all for round 1! 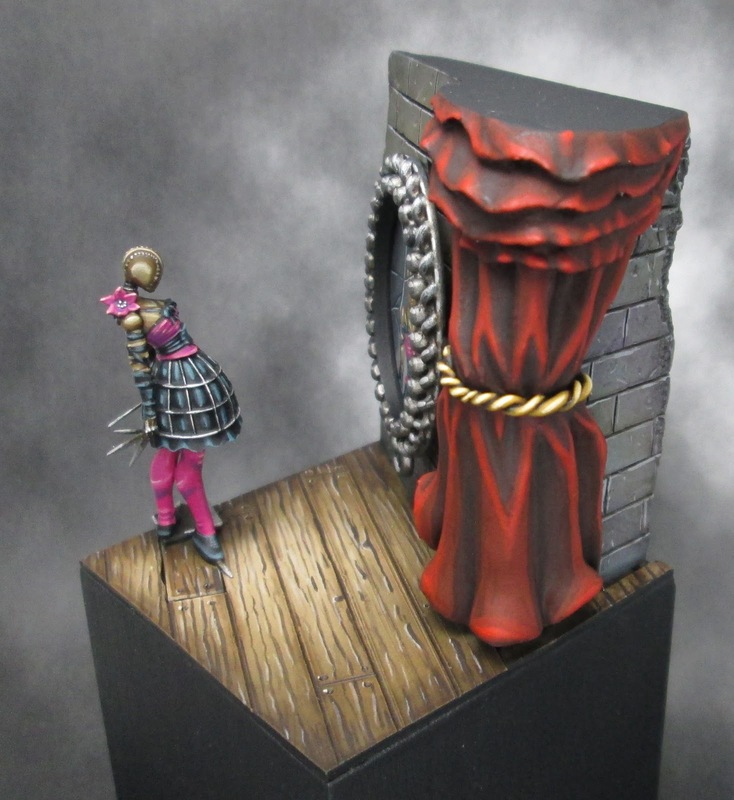 Check out some of the incredible entries over on the Wyrd forum. The models are really incredible. Definitely check out the wonderful models through the link. 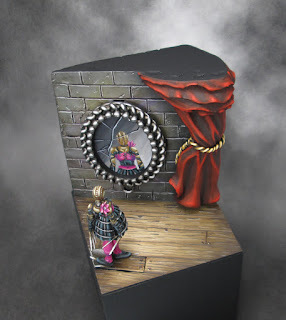 This competition brings out some of the most creative dioramas I have seen in miniature painting. The round 1 judging comes out later this week before round 2 starts next Monday. I’d love to hear your thoughts on this model. Thanks for visiting! Thanks zab. You should paint up some Malifaux models. They are lovely and wyrd has some fun competitions. I'll look forward to seeing it! This model is pretty petite too. It made it tricky to paint. No big areas to do nice blends really on the model itself. I flippin love it mate. 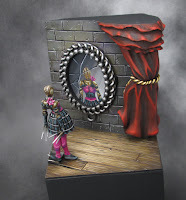 Was expecting a real mirror, instead you amaze and delight with beautifully painted freehand instead. The wood grains are convincing, the deep red of the drapes gorgeous. Thanks Dai! I had a plan to use a real mirror if the freehand fell apart. I wanted to push myself to attempt the reflection. I'm glad you like the wood grain. The relief I carved wasn't deep enough so it is almost entirely painted in by hand. Amazing. Really quite jaw dropping. The freehand mirror is a much better choice than going with the little budgie mirror. 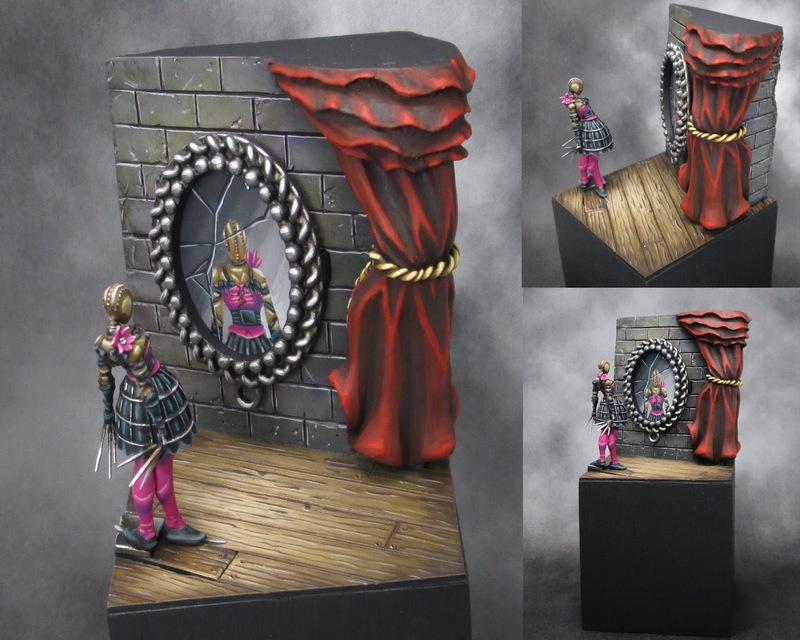 For one, it will "reflect" the subject mini from whatever angle you view the diorama from. Secondly, freehand will impress a judge with the show of extra work and skill involved. Thanks Kelly for the kind words and for your help with reflections on the VMP page. I'd like to improve my freehand partly for that reason. I'd like to improve my painting to compete in painting competitions. Really love it. The composition is fantastic, and the idea of a robot-death-mannequin that still longs to look pretty is fantastic. The free-hand mirror was a great choice, love it. Thanks Richard, I'm glad you like it. I liked the idea of trying to show the humanity of the robot mannequin. Thanks. I haven't submitted anything to them. I sent them a bug report to change it.